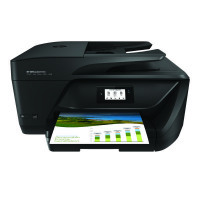 • Multi-functional Printer: Print, copy, scan and fax. • Conserve resources with automatic two-sided printing. • Print Speed: Up to 16ppm. • Print Quality: Up to 4800 x 1200 optimised dpi. • Mobile printing via HP ePrint, Apple AirPrint and Wireless Direct Printing. • 2.2 inch touchscreen display. Produce affordable, professional-quality colour that helps you stand out. Mopria-certified, and compatible with HP ePrint, Apple AirPrint and Wireless Direct Printing, this printer allows you to work seamlessly while away from your home or office. This product also features HP Auto-off technology for energy conservation, and a 2.2 inch touchscreen display for ease of use.